This week is the first of the games from my 2019 New Year article. Odd Realm is a sandbox colony building game, taking place in a procedurally generated world. It was released onto the Steam Early Access programme on 11th January 2019 and is the first game to be developed by Unknown Origin Games, who have very kindly provided me with a copy of the game to have a look at. Being set in a fantasy type world, you have a choice of a number of races to rule over, although only Humans are currently implemented with 4 more due to be added. Each race has 1 or 2 specific traits which will make your time easier. When selecting your race, you also need to name your realm and select a world seed. 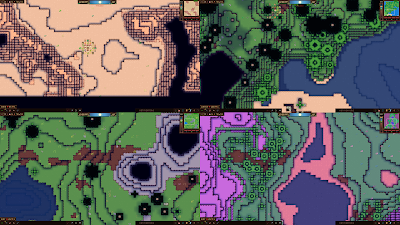 There are a number of biomes available to choose from on the world map: Desert; Taiga; Voidland; and Tropical. Each of these comes with their own benefits and will affect what resources are available to you. When selecting you will also be able to see the temperament of creatures and neighbours. You start with a small number of settlers and some basic resources to start you out. On your first playthrough, you will be presented with some tips as you play, but the game doesn't have a traditional tutorial. You also can't reset these tips without deleting a file from the Appdata folder. The game systems are fairly involved and complex. You must gather and refine resources to be manufactured into goods. 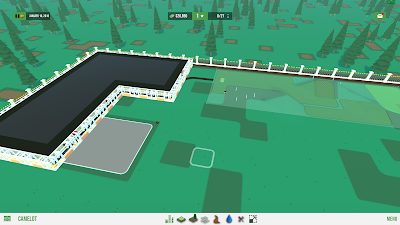 Rather than this being passive like other colony builders I've played, the game requires the player to assign a job to gather the resource and then order the manufacturing, provided the appropriate rooms have been constructed. Using a grid based system, you can build you colony one block at a time. Providing you have the resources available, you can build walls, doors, flooring etc. wherever you want. 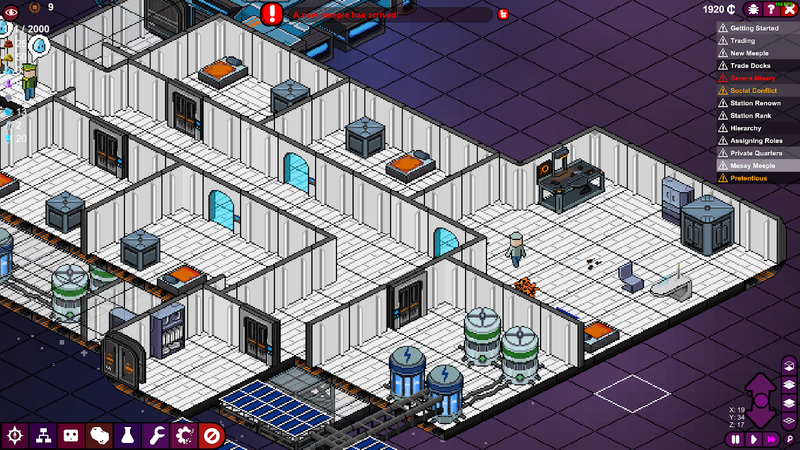 This allows you to make custom buildings and set your colony up exactly as you wish. You can also build items such as ladders and stairs which allow your settlers to move between z-levels more easily. As you explore the map, you will discover more resources, allowing you access to new blueprints. To utilise these, such as copper or tin, you will need to refine them. To do this, you will need to build a variety of rooms such as a workshop or a forge. This is done simply by highlighting an area and ensuring that it contains the relevant furniture to function. You can then give manufacturing instructions to your settlers. Some of these manufactured items will give you access to new items, such as the bronze cauldron once you have made some bronze, or will allow you to improve how your settlers work, for example upgraded tools or being able to go fishing for food. Speaking of food, this is something which needs some attention. I've had a number of false starts because I was focussed on gathering resources, or constructing buildings and forgot to build a food supply. Whilst you start with a small amount of food, you will quickly want to establish more supplies. 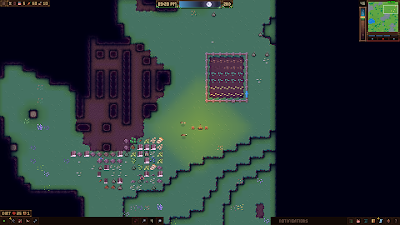 You can harvest food from bushes, although these are not plentiful, you can construct a farm to grow food and you can also domesticate some of the wild animals such as chickens. You will also need to construct a campfire for basic food and eventually a kitchen for better recipes. I've played the game for a few hours and feel that I'm barely scratching the surface so far. There are a lot of things to learn, and a lot of menus to remember which can be problematic at times. My primary issue when the Early Access was the scaling of the game and everything being very small. I'm pleased to say that this, along with some other QoL issues I experienced were things which the developer was already considering, and a camera zoom feature has already been added. The game is still very early into the Early Access cycle, being released only a few weeks ago, but feels fairly solid. Whilst I've found the game to be difficult, this is in no way a criticism. I had expected it to be more along the lines of The Settlers or The Colonists where you build a lumberjack and a sawmill then everything happens passively. This makes you pay more attention to what you are doing, and the grid building system gives you much more freedom in the way that you build and lay out your settlement, even being able to build on multiple levels. For a single person developer, the amount of work going into make the game ready for Early Access is tremendous. Since the start of Early Access, not only has he been working hard on new features (such as the zoom mentioned above) but he has also spent a vast amount of time engaging with the community. On the Discord he is answering as many of the questions being asked as possible whilst also listening to the feedback being provided, even sharing some of the player screenshots to his Twitter. The game has a lot of potential but is already at an very playable state. The one time I thought I had experienced a bug was actually user error and I have not experienced any issues such as frame drops or crashes. At the price point of only £7.19 I can't not recommend the game. The game can be purchased on Steam or Itch.io. In addition to the review copy of the game, the developer has also very kindly provided me with 2 copies of the game to pass on to you. I will be giving one of these away in my Discord server, head over to the #giveaways channel for more info. If you're not into Discord, I'll be giving the other away on Twitter. To enter, follow me and comment on this tweet. For both of these a random winner will be selected on 6th February at 2100 GMT with the winners being contacted within 24 hours. It's been a couple of months now since we last looked at Meeple Station, the new space station base builder from Vox Games and mod.io (the newly formed publisher from the team behind moddb and indiedb). When we last looked at the game it had just become available to purchase as an alpha via their own website. Well, now the time has come and the Steam Early Access release is (at the time of writing) imminent. On the day that it released into the alpha there was an update with some changes to the core of the game and this release bring another. The game sees you take control of a race called Meeple and take on the task of building a suitable space station. Depending on the 'backwater quadrant' you select to start in, you will have various raw materials available, which you can then refine into new materials, or trade with passing ships (but be wary of the pirates roaming space). You can read our previous article which gives a general overview of the game here. Since the last article the biggest change that happened, on the day that article went out, was the implementation of a personality system for the Meeple. This changes the way in which Meeple arrive on the station and how you allocate the jobs. The initial build phase has also changed with you having a starting cash budget, rather than a predetermined amount of resources. 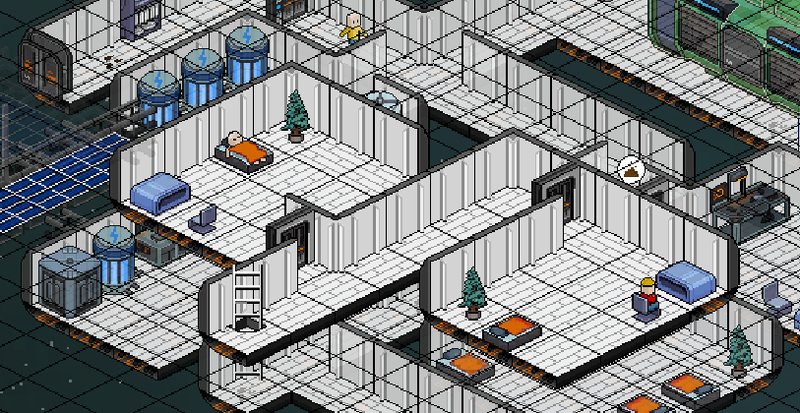 Due to the way that Meeple now arrive, you need to ensure that you have some beds available. Where you used to hire specific Meeple to fill roles, now they will arrive as long as you have available beds and a sufficient reputation. You also now need to manually set jobs by using the Meeple Menu (default M). This will display various information about your crew. For each Meeple it displays a variety of traits about how they interact with others and their work ethic. 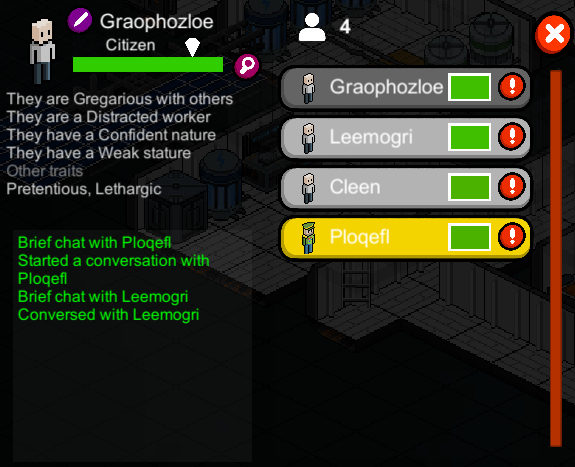 This allows you to match each crew member to their ideal job, but it also means that you can switch them between your vacant tasks as required - no more hoping for a janitor to be on the next trade ship! 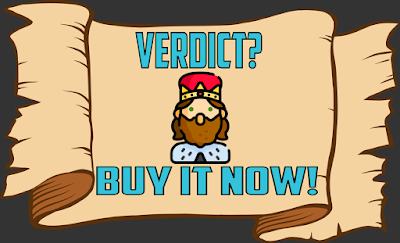 Due to the change in the start of the game, you will also now start only with whatever money you have left from your initial funding. Your first point of action should be to build up an inventory of resources from the ores surrounding you, based on the area of the map you select to start in. These will allow you to refine into advanced materials, trade with passing ships. You will also need to concentrate a bit more on the needs of your Meeple. due to the new traits system, you will have social tensions and disagreements. You may have antisocial crew who would much prefer a bed in private quarters, but they will also expect a certain level of prestige in that room. There is now a hierarchy system which will allow you to assign various specialists, such as a captain, chief engineer, chief of security etc. Each level of this will unlock when you rank up your station. These will also grant various unlocks, for example to be able to assign tasks you need a captain, a Head of Staff will unlock the scientist which allows you to carry out research, and Chief Engineer increases the efficiency of your miners and engineers. The other big change coming with the Steam release is full modding support. This will allow players to mod any of the assets in the game such as the look of the station hull or adding completely new pieces of furniture to the game. I always enjoy seeing what the mod community is able to bring and am looking forward to see what people have been working. To allow players on both the Itch.io and Steam versions of the game to enjoy mods, you can download them from here. There are already a couple of mods available, including internal walls which make station design a lot easier and nicer to look at IMO. Once you download the mod it is then a case of dragging it into a folder in your AppData and when you load the game it will open them. The devs have also made a super useful mod manager in the main menu which allows you to browse and download the mods a lot easier for end users. Over the month or so that the game has been available via their own store, there have still been a few updates, despite the holiday season. These have included many bug fixes, the base work for the modding system and some localisations. As I mentioned before it's been a pleasure to watch this game grow and develop over the last 5 months or so and the game keeps getting stronger. For a game just about to start it's Early Access journey it feels very solid. The gameplay is fun and enjoyable, the artwork is great with animations all being spot on. There are places that the game could improve, for example every time an airlock opens I get notifications of oxygen loss despite a bulkhead door, or further UI/QoL improvements, although the current UI is a massive improvement on where it was 6 months ago. There are still features to be added such as a campaign and the multiplayer co-op aspect which I am looking forward to seeing how that is implemented. Even at this point I would have no hesitations in recommending the game and certainly think it's worth a look. As noted, this article more touches on the changes in the recent build but I urge you to read the article I posted previously and linked earlier in the article. Meeple Station will be available on Steam Early Access from 17th January, owners of the pre-purchase Itch version will also receive a Steam key. Mobile Monday is where I take a look at some of the games available on Android. I don't have specific criteria, however I will be trying to stick with truly free or premium titles. Games which rely on a freemjum or pay to win model will likely not feature. These will also close with a verdict as to whether I think you should download the game. This is a monthly feature and will happen around the middle of the month (10 days after my Discover Indies post). Next Mobile Monday is scheduled for February 11th. Fiz is a game which I discovered a few years ago via the 'actually free' program on the Amazon Underground app. This was a scheme launched in response to the Amazon App Store being removed from the Play Store for a ToS violation (Google doesn't permit other app marketplaces on the store). This service allowed users to download paid apps, or purchase in-app items, for free with Amazon paying developers based on the amount of time players spent in game. Unfortunately this service is scheduled for closure later this year. Fiz is a tycoon management game which tasks you with developing your company from garage based micro-brewery to a larger scale brewery based operation. It was developed by Bit by Bit studios and, unfortunately, is their only product to date. There was signs that they were working on a second titled, however their website and social channels appear to have been dormant for a while. 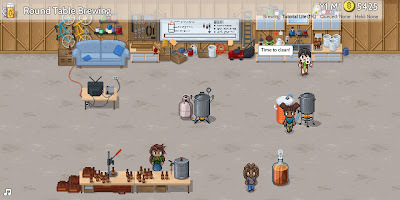 The game starts with you and 3 friends working out of a garage with basic home brew equipment and a single recipe. You are guided through your first batch by a tutorial, and there are elements of the game which are story driven. The premise is that you are being trained by locally renowned brewer Cyrus Uprum, who also provides some of the story events. As with many of these games, your first task is to select your character. There are 4 to choose from and at this point is a purely cosmetic decision, the 3 you don't choose will form the rest of your starting staff team, and will have slightly different attributes. 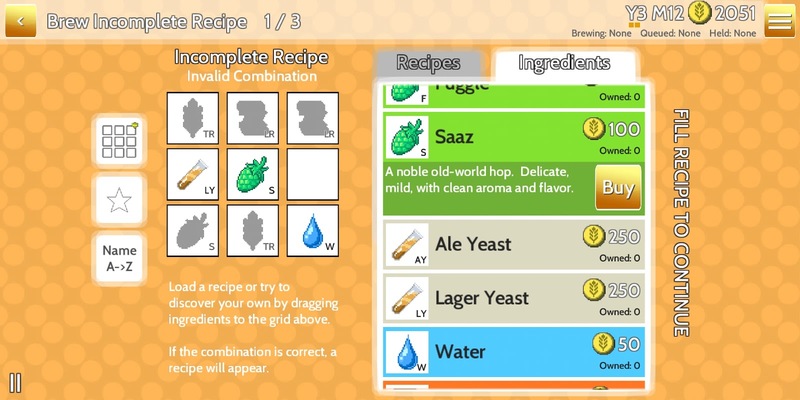 To start you only have a single recipe for a light lager, creatively named Tutorial Lite, but through the game you can expand that list by either purchasing or acquiring recipes for beers of different styles and qualities. You can do this in a few different ways. 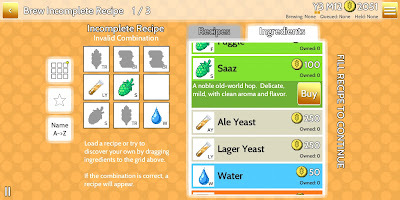 You can simply purchase them from the recipe list, experiment with the recipes to discover them (recipes are randomised each play through but will use the same ingredients in a different order), or by collecting 3 scraps of a recipe by tapping on the mice running around your brewery. After selecting your recipe and filling the relevant slots with ingredients, you will need to start the brewing process. To do this you must assign one member of your team to each of the 4 tasks in the manufacture process. These are: Cleaning, requiring a lot of patience; Mashing and Boiling, requiring intelligence and dexterity; Fermenting, requiring intelligence and patience; and Packaging, requiring manual dexterity. 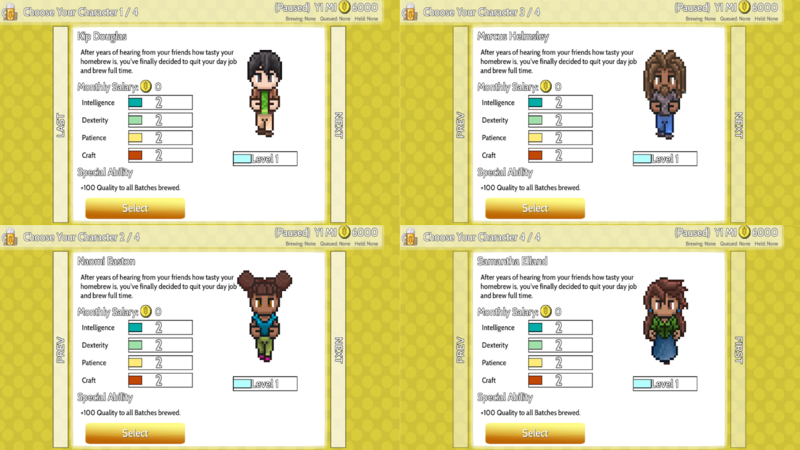 Thankfully, the game gives great visual feedback at this stage, enabling you to match your staff to the best tasks. PRO TIP - assigning the same team member to the same job will allow them to develop their skill in that area faster. The final thing you need to do before brewing begins is spend your skill points to increase yield, brewing speed or beer quality. You start with 5, but as you level up or hire new staff, this will increase. The actual brewing process is passive, in that your work in that process is complete. Your character and staff will now automatically work through the process of brewing a batch of beer. This takes a couple of minutes but there are a few things you can do during this time. I mentioned mice earlier. During brewing if you are on the main brewery screen, there is a chance that you might have a rodent problem. You can scare the mice away by tapping on them, which will give you a small reward. This will either be a small number of coins, or a scrap of a recipe (as mentioned above). You can also use this time to catch up with your management aspects or queue another batch of beer to be brewed. 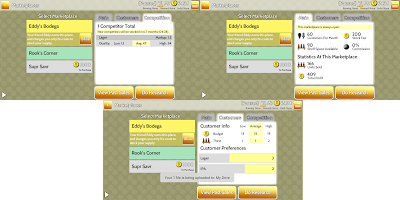 In the Manage menu you can view your staff, potential new staff, marketplaces, equipment and your storage. Both of the staff menus will display character sheets showing the monthly salary, stats, special abilities (such as a boost to quality or brewing speed), and, for potential hirees, their hiring fee. You can only ever have 4 staff, so hiring one will require you to fire another who may require a higher salary. If you cannot meet the salary, the staff member may leave. Thankfully the game has a mechanic meaning you will never find yourself completely stuck as your starting staff have no monthly cost and will happily come back should you find yourself with an unfilled vacancy. Marketplaces will show you all of the unlocked marketplaces available. You will need to use your earnings to purchase access to new markets. Each of these have a different clientele or specialism - for example the Surf Shack is only open during the Summer months and specialises in lagers. 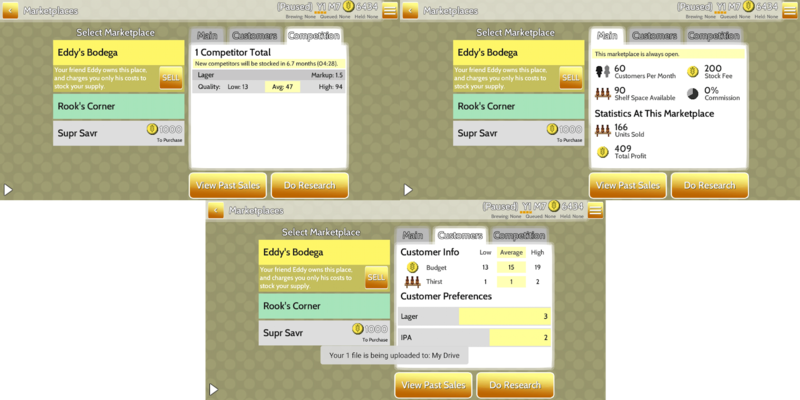 Each market has 3 tabs: Main, showing basic information such as their monthly customers, price for stocking your products and commission taken by the seller; Customers, where you can see the general budget of customers, their thirst and beer preference; Competition, where you can see the other beers currently stocked in the market, their markup and overall quality. From this screen you can also see information about your past sales in that market, and carry out research to populate the details in the Customer screen. The budget is how much money in total the customers have to spend and the thirst is the number of beers they expect to purchase within that budget. The Equipment screen allows you to purchase upgrades to levels 2 and 3 of your brewing stations: Cleaning; Mash Tun; Turkey Fryer; Glass Carboy; and Packaging. By upgrading these you can get various boots to your production process such as higher yield or quality. The Batches screen will let you see information for every batch you have every brewed and its status, such as in storage, sold out or expired if you haven't sold out prior to the beer going off. If you select a batch you can also gather some more detailed metrics through feedback from the sale. This includes your costs, profits and customer feedback. In addition to simply brewing to make money, there are also over 60 challenges and events to tackle through the game. Beating all of these gives the game in the region of 20 hours play time. 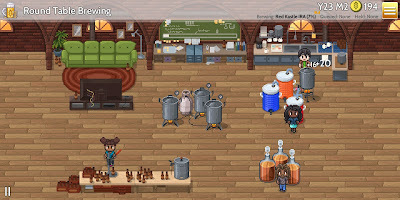 Some of these will give you rewards such as ingredients or recipes, whilst some will advance the story and allow you to move to bigger and better brewing premises. Whilst it can often be tricky to make money, it is impossible to reach a point of no return in the game. As with the staff mechanic mentioned earlier, if you get to the point where you can't afford a batch you will be able to 'find' the ingredients for your basic lager and your pal Eddy will waive his stocking fee for that batch. Whilst this is welcome at times, it does sometimes mean that I will take risks which I might not otherwise as I know that safety net is always there. This game is right at the top of my favourite Android games list. Not only does the game not rely on in-app purchases, it also gives a very strong experience. 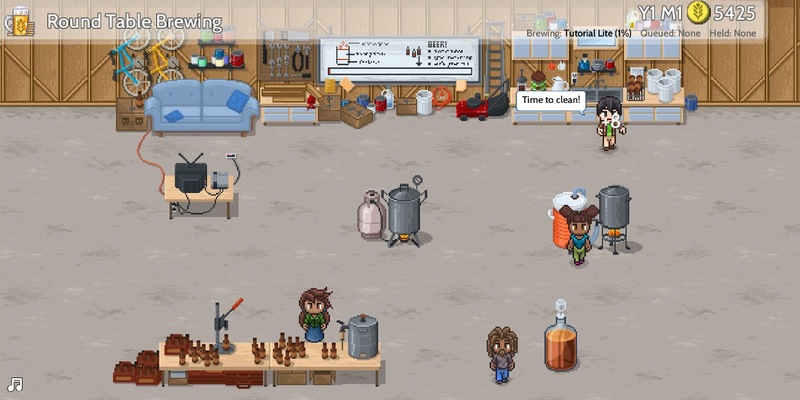 If you have played Game Dev Tycoon you will be familiar with the sort of game that this is, and how well it lends itself to the mobile market. You can spend a couple of minutes making one batch, or you can find yourself lost in the process of running your company. The game is regularly available on sale but I'd say even at the list price of £2.69 it is more than worth the cost and stands out as a good example of how games can be done well on mobile. 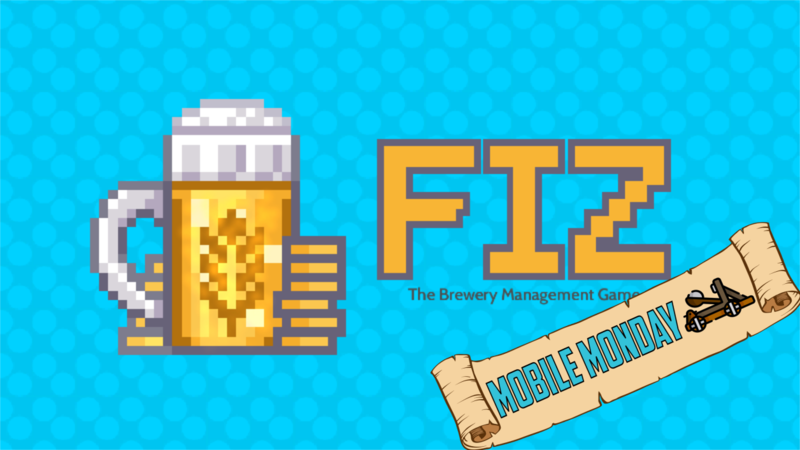 You can purchase Fiz: Brewery Management Game from the Play Store or (for the slightly higher price of £2.99) from iTunes. 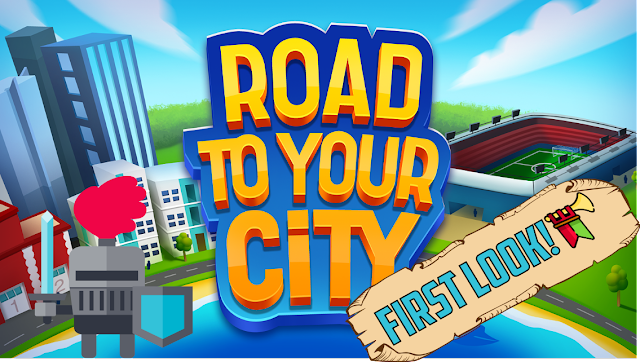 This week we are taking a look forward to a game that is still in development and having a first look at Road To Your City. Given that the game has not yet reached an early access state, some of this information may change closer to release. The game will be released for Windows, MacOS and Linux in 2019 with a Kickstarter campaign launching January 14. The game is being developed by German indie Yheeky Games, and will be their first release on Steam. Road To Your City started life in 2014 and all development has been done by a single developer in his spare time. The game is a 2D-isometric city builder (I do love my isometric 2D games!) with a twist - not only do you need to make your city somewhere appealing to live, but also allow your citizens to engage with their favourite past-time, football. The game has also been built in it's own engine, which has been developed over the past four years. Whilst you are developing a city with a successful football team, and managing how that affects your city, you won't spend hours getting trapped in the minutiae of building a team, training and playing about with tactics. 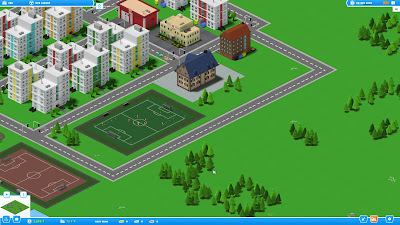 In this game you will have a less direct influence of the football aspect by building training grounds, stadia and managing your city to satisfy the needs of your citizens. You will have to, of course, manage match day challenges too - how do you get the away fans into and around your city, and how do you separate home and away fans to prevent riots? When you start out, you have a blank map and must first decide where your city will connect to the mysterious highways, like the older SIMCity games, and place your mayors house. Once you have got these essentials in place, you can begin to develop your city. Your initial task is to build housing for your potential citizens, however without jobs these will lie empty. Unlike other city builders it isn't just a case of throwing down some commercial and industrial zoning and hoping for the best. In Road To Your City you must build workplaces and assign the number of jobs available. 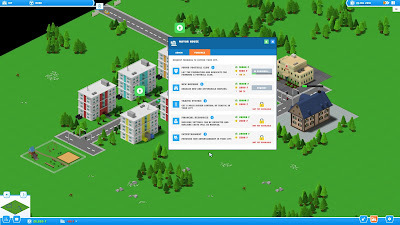 You will also need to reach certain milestones with your city to allow you to access more features. This is done through applying for funding. These will have an initial cost to apply for, but will give a much greater reward if successful. If you are awarded the grant, this will also open up further avenues for developing your city, or your soccer team. The first grant you are likely to want to apply for is to found your football club once you have at least 10 children living in your city, as these will become your first players. Once you have established your club, you will need to ensure that you are providing suitable facilities. Without training grounds, you won't be able to develop your team resulting in demotions. You will also need to develop your players stating from the 'mini' team and working up through the juniors to your first team. 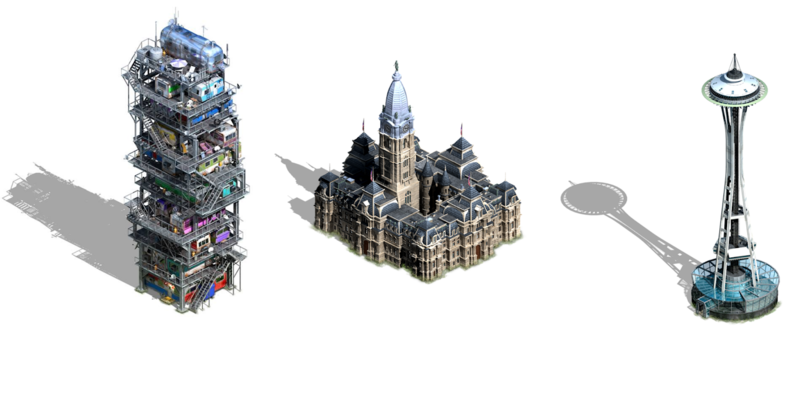 Meeting the needs of your citizens and players will result in promotions to higher leagues, and with it new buildings you can unlock. The game is currently in an alpha phase with a (very) small closed alpha currently in progress, with a release window yet to be specified but hopefully entering early access later this year. The game has certainly grabbed my attention and will be very much on my radar looking forward through 2019. You can get some more information by following the devblogs on IndieDB and also the devvlogs on YouTube. You can also join the community on Discord where you can also chat directly with the developer. Road To Your City is now available to add to your wishlist on Steam. Flashback Friday is a feature where we will take a trip down memory lane and enjoy a game from years gone by. This occurs on the first Friday of each month (Last Friday from February). Criteria for being featured as a Flashback Friday game are that the game must have been initially published in 2010 or earlier (at times I may look at a more recent HD remake or repackage) and the game must still be obtainable from a legitimate source. 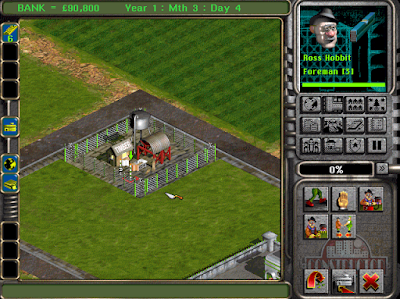 Developed by British studio System 3, Constructor was initially published for MS-DOS systems in 1997. It was later ported to Playstation, MacOS, Windows-native DirectX3, Playstation 3 and Playstation Portable systems. In 2017 the game had an HD makeover and was released on Windows with PS4 and XBONE versions also available. 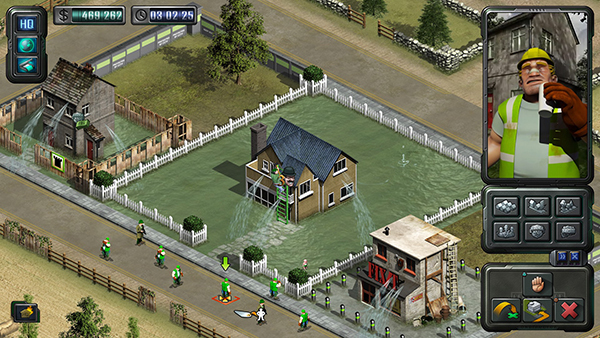 In addition to shiny new HD graphics, the game also had some additional gameplay features such as a tutorial and campaign added. It has also just been announced that due to the success of the HD remake, a sequel titled Constructor Plus will be released for Switch on 19th February with details of other platforms to follow. This will also feature approximately 80% more content and new building themes. Existing owners of Constructor HD on PC, PS4 and XBONE will also be eligible for an exclusive discount in the first 30 days post release. This will reduce the game from its standard £19.99 to £9.99. With this news, I felt that having a trip back to 1997 to play the original Constructor was a good idea. Rather than Constructor HD I've been playing Constructor Classic 1997. Unsurprisingly, the game puts you in charge of a construction company where you must progress from slum lord to property tycoon. The map is also split up between a number of companies with whom you must compete to achieve your goal, such as reach a set bank balance. 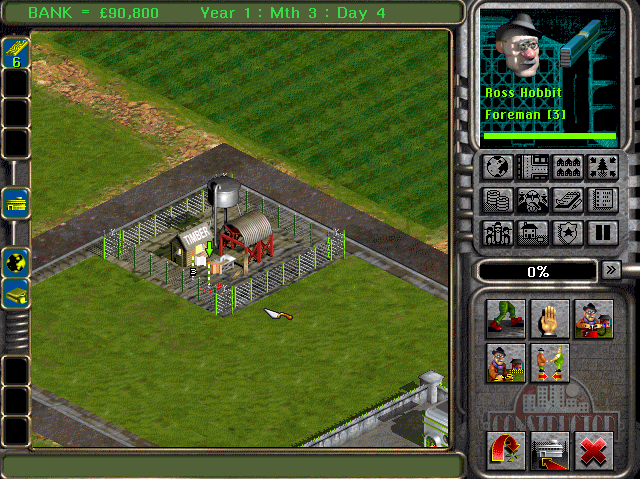 As you would expect from this style of game, you start with a basic HQ, a plot of land and a lump sum of cash. In order to progress you will need to produce various resources and goods, starting of course with wood, to allow you to unlock new buildings and building upgrades. You also start with a small workforce. 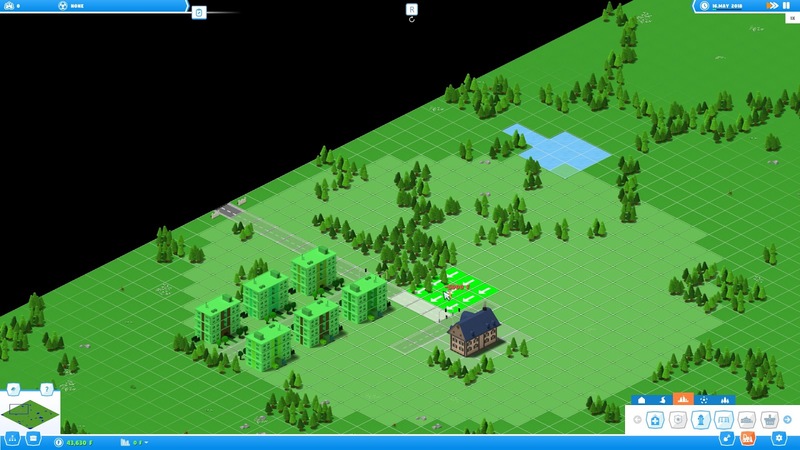 This will allow you to start your journey to property magnate by constructing some basic housing. The houses available to you are initially basic wooden shacks, although you will get concrete homes after a short time. Once a house is completed you must move in tenants. Once you have selected your tenants you will be able to set the house to generate income, new workers or new prospective tenants. Your tenant will also come to you with various problems, such as fires in local buildings or being located too close to factories, and give you a set time period to rectify their complaints. As I often find with these games, it is very easy to get carried away with building and making every available building as soon as it becomes available. This can cause issues with the number of workers and foremen available as, in addition to the work teams doing building work, you need to assign workers to your factories to produce the goods. This makes it important to be strategic about what you are building, and when. As you build your property empire, you will face various challenges. 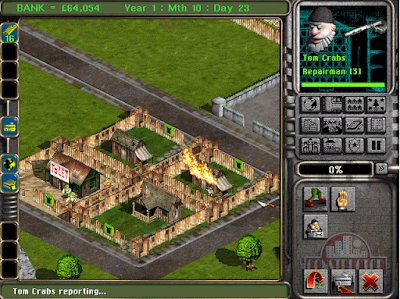 Burning buildings left unchecked can explode, taking out other nearby buildings and leaving you with a shortage of workers and available tenants; rivals may start building on your lots; or undesirables may cause havoc. These undesirable citizens, such as hippies and mobsters, can also be used to your advantage. Once these groups have become a part of the local community, you can assign tasks for them in the same way as houses. Examples are that you can ask hippies to move into an unoccupied home of a rival company and turn it into a squat, or ask the mob to bribe city officials. Overall, the original game doesn't hit that nostalgia spot that I remember. This is probably due to the lack of a tutorial and quite deep, complex systems. 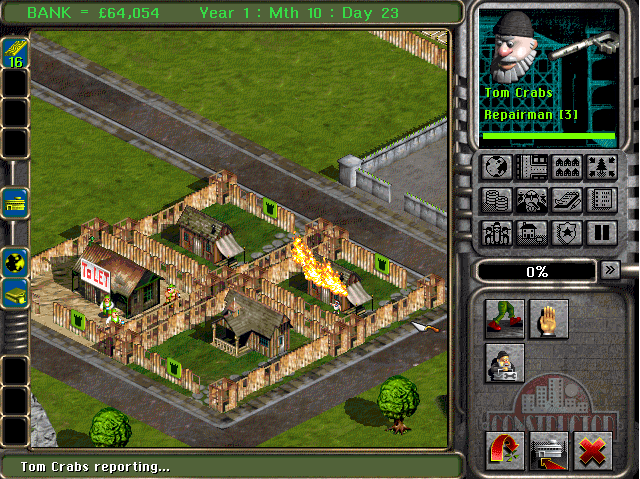 In all honesty, I had completely forgotten how hard the game was, and got frustrated with it due to a shortage of workers and a house fire destroying all 8 of my houses. With more time to sit down and work everything out again I would probably have enjoyed it a lot more. 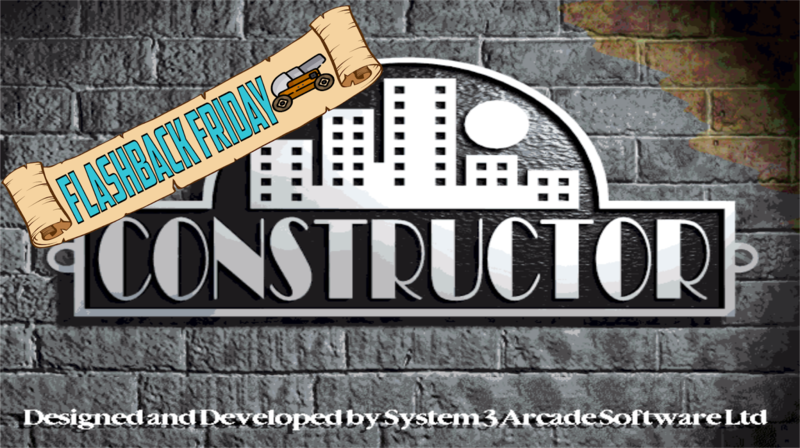 I certainly plan on picking up the HD version at some point, to see if the tutorial and campaign make the game more enjoyable, and definitely looking forward to seeing what Constructor Plus brings to the table. I'd also like to thanks everyone who has visited the site, helped me out with advice and given me their support over the last few months. It's been a great ride so far, starting out from an idea which I didn't know if it would work or I would stick with it, into the growing platform it is. 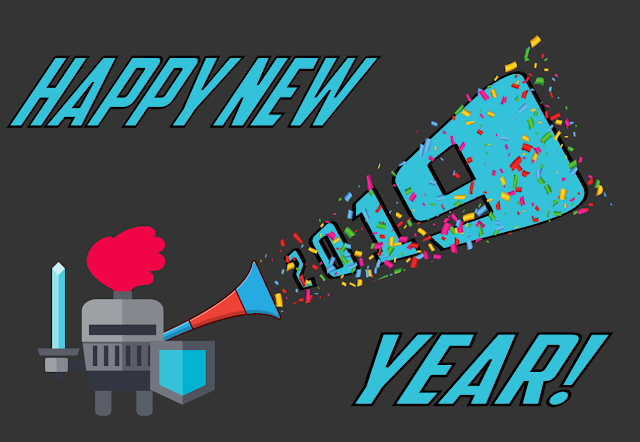 In 2019 I will be continuing my usual schedule of reviews and first looks on a Wednesday and the monthly Flashback Friday at the start of each month. I'm also going to be adding a Mobile Monday into the rotation. This will look at games released on the Android platform and I'll be trying to stay away from games using the freemium model. The first of two games on the list being brought to us in Q1 by Excalibur Games, Resort Boss: Golf is the product of frustration trying to get SIMGolf working on modern systems. 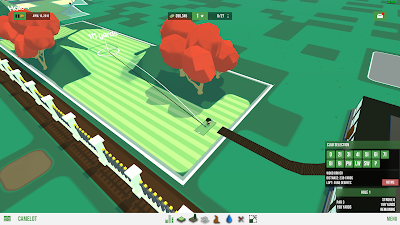 The game will allow you to develop and manage all aspects of a golf resort. Not only will you be placing service buildings, such as a hotel and golf shops, but also sculpting the landscape to give complete customisation to your gold course. Not only will you be able to plant trees, add hazards like bunkers and hire/fire staff to help balance your books, but you will also be able to ensure your courses are functional and enjoyable by playing a round yourself. 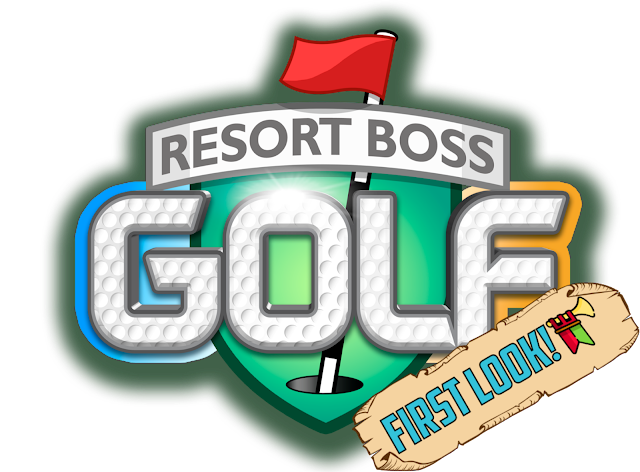 Start off with a one-hole course and build up to the ultimate resort. The game will be released into Early Access on Steam on 14th February (add to your wishlist now) at a cost of $12.99/€11.99/£10.99. Look out for our review coming mid-February! The second game on out list by Excalibur Games, Willowbrooke post is a Story-based management game. Using the familiar trope of games such as Stardew Valley and My Time At Portia, your parents have left you in charge of their beloved post office. Starting with only a small number of coins, you must provide the postal service to Willowbrooke, and, importantly, uphold the reputation of your family. Hopefully when your parent return in 1 year you won't have run the post office into the ground! As part of running the post office you will need to process the various items. This includes sorting parcels, stamping letters and ensuring that your ledger remains balanced. 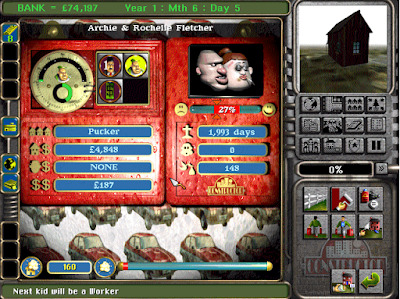 The game also features a social system meaning you need to manage your relationships with members of the local community. The game is to enter Early Access on Steam on 14th March. Add it to your wishlist and look out for the review nearer the time. 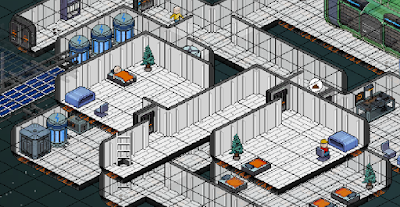 Being developed by Erik Asmussen of 82 apps, Factory Town is a game about logistics planning and optimisation. 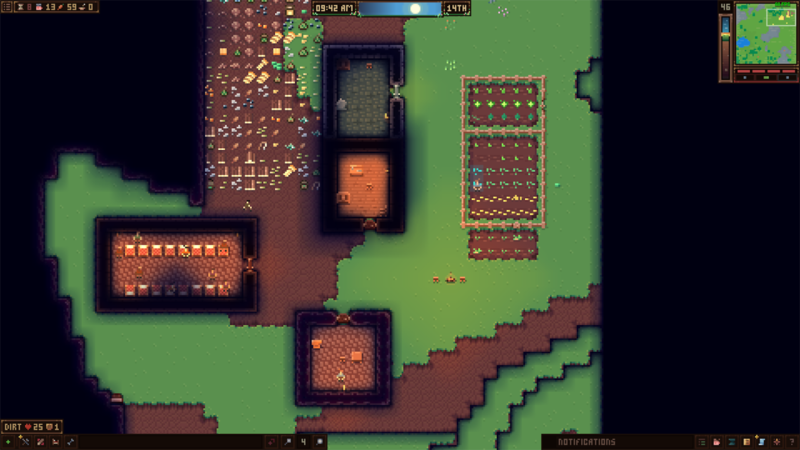 Starting with only a simple base and 4 workers, you must build your colony, ensuring adequate resources to drive your supply routes and, ultimately, colony growth. Not only do you have the usual workers and roads you would expect in a colony builder, you can also harness advanced technologies. These will allow your supply chains to work more efficiently, and allow for a degree of automation. These include 'marble-run' type delivery chutes and minecarts. Prevent bottlenecks in your network and develop into a sprawling metropolis. 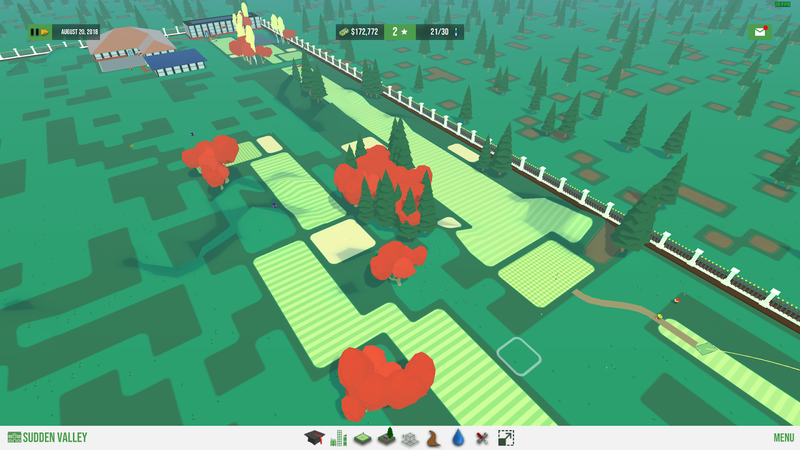 Factory Town will be released on Steam in Q1 of 2019 and can be added to your wishlist now. If you can't wait you can purchase the game on itch.io for $20 which will give you immediate access to the beta and a steam key upon release. Keep an eye out for my review coming soon. Have you ever dreamed of being Kevin Flynn and running your own arcade? Arcade Tycoon allows you to live out that dream! Starting from scratch with an empty building you will decide what cabinets to purchase, how to lay out your arcade for maximum impact and when to hire (or fire) your staff for maximum profit. With both a 20 level campaign and a sandbox mode, and featuring over 100 arcade machines and a plethora of scenery items, the game promises to have something for everyone. Get your virtual quarters at the ready and wishlist the game on Steam now, prior to the start of Early Access in April. This game is a bit different from anything I've covered before, but it's being made by a local dev team so feel it would be good to give them some coverage. Being developed by Glasgow studio Blazing Griffin, The Murder Mystery Machine is a procedurally generated detective game. Drawing inspiration from the likes of Agatha Christie, Sir Arthur Conan Doyle and True Detective, you will need to examine and analyse the available information to solve the crimes. Combining abstract story telling and puzzle-solving, you are presented with a scene and mus decipher the clues, and write your own version of events to work out what happened. Scheduled for a Steam release 'Early 2019' the game is available to add to your wishlist now. This is simply a list of some other games I'm looking forward to and is no reflection on the quality or anything at all, just trying to keep my article a reasonable length. The last project I want to mention is an interesting new indie launcher called Meditations which will deliver one small indie game per day for the next year. This seems an interesting project and something I hope to look at in more detail. As I mentioned earlier, thanks to everyone who has visited the site and offered support over the past few months. Since starting out in August there has been almost 3000 page views, more than I thought I'd be at by this point. I am looking forward to seeing what 2019 will bring, and looking at ways to further develop and diversify. All ideas, thoughts and suggestions are welcome. Please reach out via Twitter, Discord or the contact form to the right. Wishing each of you a very happy, safe and prosperous new year!